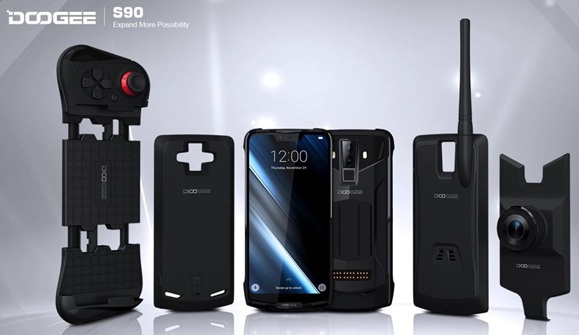 DOOGEE, one of the reputed brand and Chinese smartphone manufacturer is about to launch DOOGEE S90 smartphone on January 15, 2019. The phone comes with potential features. Yes, all-in-one Modular Rugged Phone. We got some leaks about Doogee S90 mobile phone's features and offers which we are going to share here prior to its launches on scheduled date. This phone might be the successor to Doogee S80. The brand has earlier released some of the smartphones like DOOGEE BL12000, BL9000, S80 Lite, Y7, Y7 Plus and Y8 etc. If you are interested to know Doogee S90 phone's features, technical specification, price, release date, photos, first impression, unboxing, review, comparison and hands-on etc. then you could find some of them over here and we would publish rest of the detail on this website very soon after it is officially launched it. The phone may be powered by MediaTek Helio P60 quad-core processor and coupled with 6GB of RAM. The cell phone might come with different variant as well. The internal storage of the phone could be 128GB or 256GB variant. Doogee S90 would run with the latest Android Pie or Oreo operating system beside brand's custom skin. Doogee S90 possibly arrive with 6.18 inches FHD+ display screen and GPU feature. With regards to its camera, the phone would come with 16+8 megapixel dual rear cameras and 8 megapixel selfie set up. The gadget seems filled up with as many features including Game mode, Night vision camera mode, Walkie-talkie mode and power mode etc. The battery of the device is expected to be 5000mAh and above. Let us wait and see how it really goes officially. This could be one of the best features smartphone at the moment. You can check Doogee S90 phone's specs and price detail below which we would confirm them at a later stage. Tips: One of the most features packed smartphone to grab it.